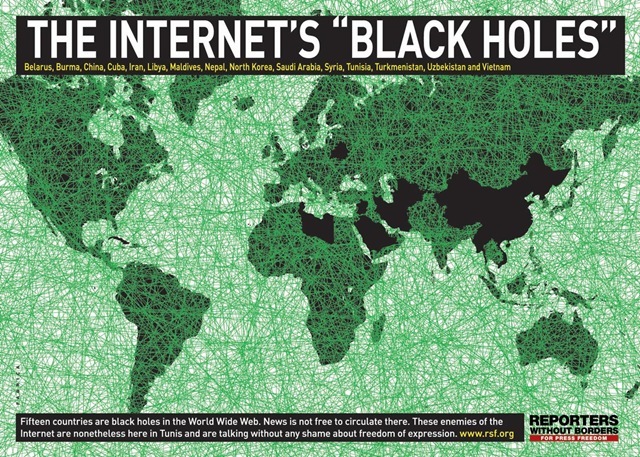 I came across this (dead link) story (http://digg.com/tech_news/The_Black_Hole_Of_The_Internet_Pic) which lists down 15 countries as black holes spread around the World Wide Web, preventing free flow of news and information sharing over Internet. These countries include Belarus, Burma, China, Cuba, Egypt, Iran, North Korea, Saudi Arabia, Syria, Tunisia, Turkmenistan, Uzbekistan and Vietnam. Even India hasn’t been completely oust from this phenomenon – remember blogs being blocked in India or Tehlka episode, reporters of which are questioned by police till date and which made them turn their website into online version of their print edition.